Heat oven to 350ºF. Spray bottom only of 13x9-inch pan with cooking spray. In large bowl, stir bar ingredients until soft dough forms. Press dough in bottom of pan. Bake 15 minutes. Cool about 10 minutes. 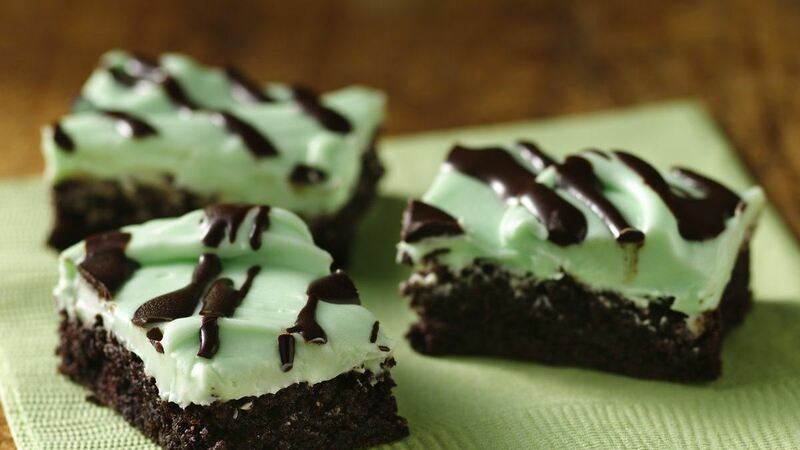 In frosting container, stir in mint extract and food color. Spread over bars. In small microwavable bowl, microwave glaze ingredients uncovered on High 30 seconds; stir until smooth. Drizzle over frosting. Refrigerate 30 minutes or until set. For bars, cut into 6 rows by 6 rows. How-To: Line the baking pan with foil for easier cutting and quick cleanup.